The Turkish president has vowed to reveal the “naked truth” about the killing of journalist Jamal Khashoggi at the Saudi consulate in Istanbul. Recep Tayyip Erdogan, who has stopped short of blaming the Saudis, is due to address members of his ruling AK party. 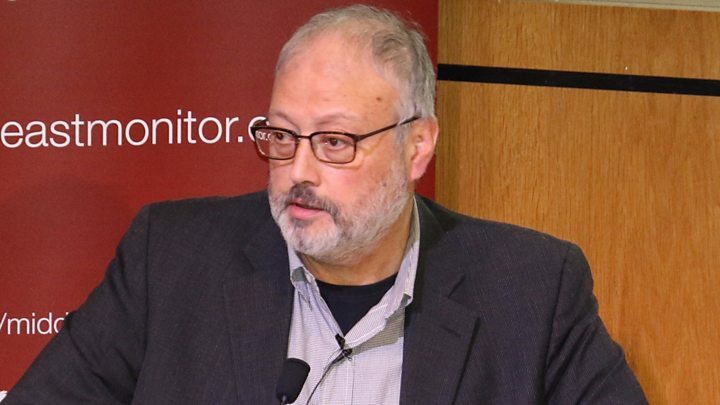 Turkish officials say they have evidence to show Khashoggi was murdered in the consulate on 2 October. After weeks of conflicting accounts, the Saudis now say he was killed in a rogue operation. Tuesday’s address by President Erdogan coincides with the start of an investment conference in Saudi Arabia that has been overshadowed by the Khashoggi case, with dozens of government and business leaders pulling out. Many world leaders have condemned the murder of the Washington Post contributor and demanded a full investigation. In his latest comments on the case, US President Donald Trump appeared to support Saudi Arabia’s version of events, telling USA Today he still believed the killing was “a plot gone awry”. Despite the growing concern, US Treasury Secretary Steven Mnuchin held talks with Saudi Arabia’s crown prince in Riyadh on Monday. What has Turkey already said about the killing? Turkish officials believe Khashoggi, a prominent critic of the Saudi government, was murdered by a team of Saudi agents soon after he arrived at the consulate to obtain divorce papers nearly three weeks ago. Investigators say they have audio and video evidence to back up this claim, and some of the lurid details have been leaked to Turkish media close to the government. However, this has yet to be made public. 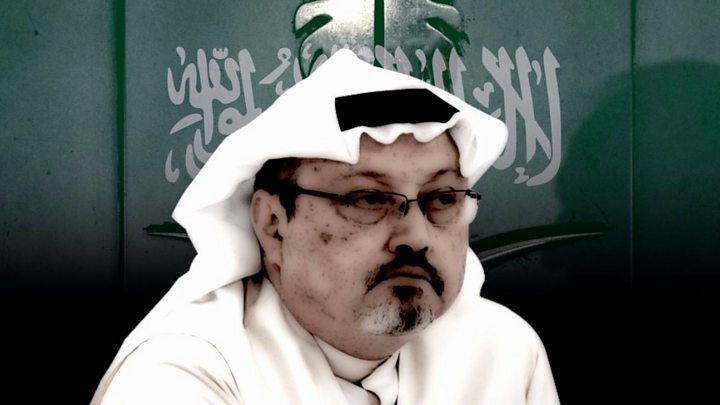 These include reports that 15 suspects arrived in Turkey from Saudi Arabia hours before Khashoggi’s disappearance and dismembered the body with a bone saw. Turkish police have so far searched the premises and grounds of the consulate, and the residence of the Saudi consul, as well as a nearby forest where they believe the body may have been taken. On Monday Turkish police found a car belonging to the Saudi consulate left in a car park in Istanbul. Turkish media also posted footage apparently showing Saudi consular staff in Istanbul burning documents a day after Khashoggi’s disappearance. 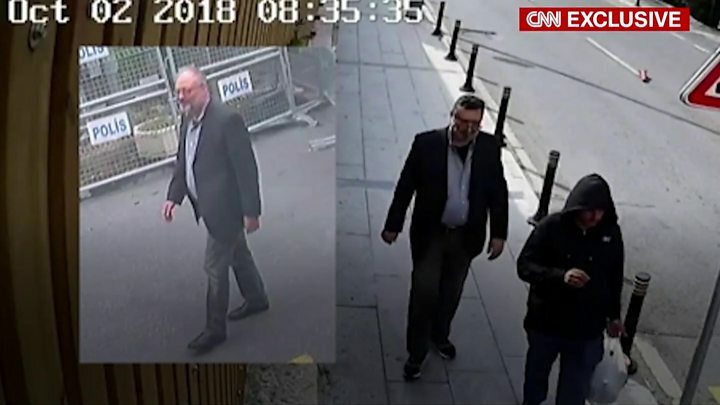 Separately, CNN broadcast images appearing to show a Saudi operative leaving the consulate in Khashoggi’s clothes, wearing a fake beard and glasses on the same day he was killed. After weeks of calculated and often lurid leaks to the Turkish media, Tuesday morning’s statement by President Erdogan is eagerly awaited. Turkey has promised “a full account” of what happened to Mr Khashoggi, with nothing held back. So that would include the widely reported audio tape from inside the Saudi consulate then? And evidence of the “bone saw” allegedly brought in by the hit team that killed him? Because both of these elements are crucial in establishing the facts about what happened and the motives of his murderers. If evidence of the bone saw can be produced then it would certainly imply murderous intent by the hit team from Riyadh. The audio tape of his murder – if it does exist – could be excruciating to listen to – but is an essential part of the puzzle of how Mr Khashoggi died. But Turkey, a country that has itself jailed more journalists than any other nation on Earth, may have its own reasons for holding back on what it has. For the full story, we may have to wait a little longer yet. How has the Saudi account changed? He said that Saudi Arabia did not know where the body was. An unnamed Saudi official told Reuters on Sunday that Khashoggi had died in a chokehold after resisting resisting attempts to return him to Saudi Arabia. His body was then rolled in a rug and given to a local “co-operator” to dispose of. The Saudis say they have arrested 18 people, sacked two aides of Mohammed bin Salman and set up a body, under his leadership, to reform the intelligence agency over the killing. What does the US say? Treasury Secretary Mnuchin’s meeting with Crown Prince Mohammed bin Salman – widely seen as the kingdom’s most powerful figure – was held behind closed doors, but a spokesman for the department said Khashoggi’s death was among the issues discussed. US media reports say CIA chief Gina Haspel is on her way to Turkey to help with the investigation. Is anyone attending the investment conference? At least 40 attendees have withdrawn from the Future Investment Initiative, a conference dubbed “Davos in the Desert”, that begins in Riyadh on Tuesday. The big names may have pulled out, but hundreds are still attending – in some cases representing the very companies whose bosses decided it was no longer expedient for them to attend, the BBC’s Arab Affairs editor Sebastian Usher reports from Riyadh. The talk among delegates is of pragmatism, that there is a big future at stake in Saudi Arabia and this obstacle – however shocking and overwhelming – will eventually be overcome, he adds. Saudi Arabia has come under increased pressure from its western allies over the killing, with Germany halting arms exports and Canada threatening to cancel a multi-billion-dollar defence contract. The kingdom still has the support of some of its regional allies, including Kuwait and Egypt.